Peanut Butter Bars. If you have been following this blog for a while, you know how much I love nut butters. I even wrote a whole cookbook about them! If you love nut butter too, you will LOVE these peanut butter vegan bars. They contain very little added sugar and only 5 ingredients. You don’t even need a food processor or mixer to make them! These bars are vegan and gluten free. You can make them with sunflower butter or almond butter to keep them paleo friendly as well. These Peanut Butter Bars are super rich too. All you need is a little to satisfy your sweet tooth. If you didn’t want to use chocolate chips, you can always use my 3 ingredient chocolate bar recipe for the chocolate part. If you choose that route, I would suggest keeping the bars in the freezer, not the fridge. If you also love peanut butter, you will also love my 3 ingredient peanut butter muffins and my 3 ingredient peanut butter cookies. 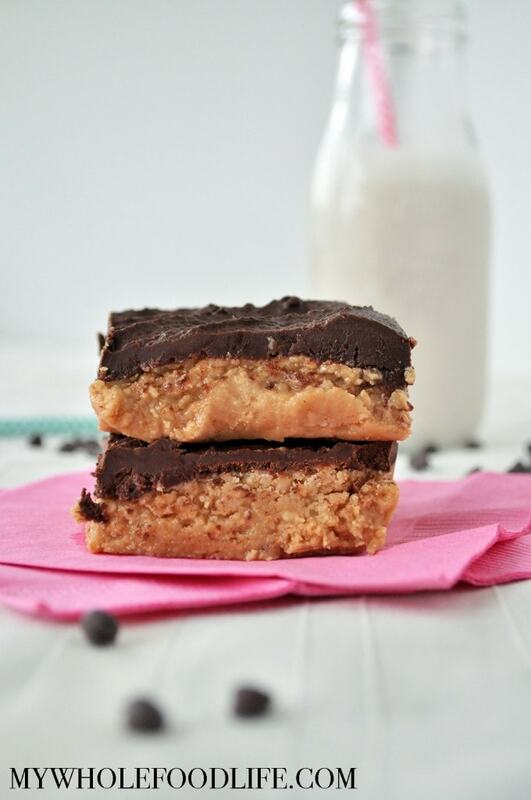 Just a handful of simple ingredients are needed to make these decadent peanut butter bars! In a saucepan , on medium heat, combine the peanut butter, coconut butter and maple syrup. Stir only until everything is combined. Pour the mixture into the pan. Place in the fridge for about 30 minutes. In a double boiler, melt the chocolate chips and almond milk. Once melted, pour over the peanut butter layer. Sprinkle with sea salt if desired. Let chill for another 30 minutes. Using a pizza cutter , cut into squares. Keep these bars stored in the fridge. They should last a couple weeks that way. Enjoy! Oh. My. Goodness. You are speaking my language with these girl! I WILL be making them this week though I doubt they will last more than a day or two in my fridge ha! Lol!! They probably won't last long here either! These sound wonderful and my husband will adore them. One problem - where to find coconut butter. I live in Central Florida and there is no such thing. Thoughts? How does coconut butter compare with coconut oil? Coconut butter is made from coconut flesh. Coconut oil is the oil expressed from the coconut. Sometimes they can be used interchangeably, but I am not sure that is the case in the recipe. If you try oil, I suggest using only 1/2 cup oil. Did you try the coconut oil Erin? Oh, boy, do these sound amazing! And since they're healthy, I'm definitely going back for seconds! I just want to sink my teeth in one of these bars! So good!!! only 5 ingredients?!! I love these! A dessert I don't have to feel guilty about - perfect! Hello, I really like your recipes, but do not understand what this measure "T", for example maple syrup 3-4 T 2 and T almond milk. I really like that you used maple syrup as a sweeter - I do this all the time! Well, and peanut butter and chocolate are just best friends! Peanut butter and chocolate is my favorite flavor combination. These look so good! Haha! Thanks! It is hard to have just one! Only five ingredients? I can't wait to try these!!! I mean - they're just so simple. And PB and Chocolate? Yes please! You're welcome! Good idea to add crispy rice! Do you have coconut oil? For this recipe, that may work. What could I sub for Coconut butter? My husband hates coconut flavor. You can try using butter. I'd like to make this using a semi-sweet chocolate bar instead of chocolate chips. Any advice on method and ingredients such as amount of maple syrup, etc? Thanks. What is the carb count on these for diabetics? Is there any way you can include carb counts in your recipes online? Thanks. Hi Lynn, Unfortunately, I am not a dietician, so I don't feel comfortable adding that to my recipes. I'd hate to be off on my calculations when it comes to a diabetic. However, you can upload any one of my recipes into My Fitness Pal for a breakdown.